If you find yourself in any of these situations, the best option may be to sublet the apartment. Someone else gets a much-needed place to live without committing to a full-term lease, you don't waste money paying a penalty to your landlord, and your landlord doesn't have to scramble to get the apartment filled before the end of your lease. Everyone wins. Check your lease. Is subletting specifically prohibited? If so, approach your landlord. How you approach your landlord will depend upon your existing relationship with him or her. If you can just be honest and explain what you want to do, great! Assuming that you decide to proceed with subletting, here are a few steps to make the process as smooth as possible. Before putting the apartment on a listing site, check with your friends and family members. Would one of them be interested in subletting from you, or do they know someone who would? A personal connection and referral almost always beats a random subletter, provided your friends and family members are responsible and respectful of the space. Are there certain rules that someone who sublets your apartment needs to follow? These could include no smoking, sorting the trash, collecting your mail, pet policies, or taking care of your belongings for an extended period of time. Make sure you're clear and upfront about these types of expectations so there are no gray areas down the road. Subletting an apartment shouldn't be done on a handshake, even if it is between friends or family members. To protect both parties, draft up a simple lease. There are a number of free templates available online. Rocketlawyer is a popular option for this, as is LawDepot. 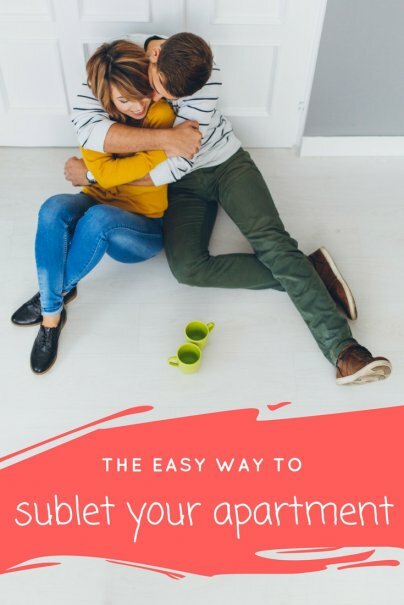 The lease should include the monthly (or weekly) rate for the sublease, the beginning and ending dates of the lease, the name of the person (or people) who are going to be living in your apartment, and any of those boundary specifics mentioned above. It's a smart idea to collect a security deposit from the person or people who sublet your place. This can be helpful if the renters need to break their sublease or if there is damage done to the apartment. Remember, even though you're subletting, you are still legally responsible for the condition of the apartment when the lease is up, and if there are damages, your landlord may charge you for the repairs. A few years ago, I wanted to try living in California for the summer. Rather than sublet my place in New York and find a sublet in California, I arranged a swap. A mother and daughter stayed in my apartment while I lived in their condo in Santa Monica. We followed all of the same steps above that I outlined for a sublease and we both got a summer experience we would never forget. In my situation, I wrote a post on my blog and someone found the post. It all worked out in a pretty magical way. If I tried this again, I would work through my network first to see if I had any friends, family members, or friends of friends who would be interested. If that didn't work out, I would try one of the new housing swap services that have popped up since I did my home exchange. HomeExchange.com has more than 65,000 homes in 150 countries. Members pay $9.95 per month to list their property with the service. They facilitate over 120,000 swaps per year. Love Home Swap is another site with a few different swap models. You can do what they call a "Classic Swap" in which you go to someone else's home and they go to yours for a specific amount of time. They also have a "Points Swap." Rather than having to agree on dates and location, you rent out your place whenever it's available for points instead of money. Then you can use those points to make a reservation for an available property on the site when you want to travel. Before you use a service to facilitate a swap, make sure the site is secure, that it verifies each user's identification, and the service has legitimate reviews on sites like Yelp. With any swap, have a legal agreement in place between you and the other party to make sure there are no surprises and that all terms are clear. If life leads you in a direction away from your current lease, don't resist that call. There are numerous ways to manage a lease rather than have it manage you.